12X magnification to get you 12X as close to what you&apos;re shooting with your cellphone. The novel optical path design has the advantages of ultra far view, large light quantity, high resolution and high color reduction, aiming to greatly improve the quality of your photos. It is easy and convenient to install, remove and operate. 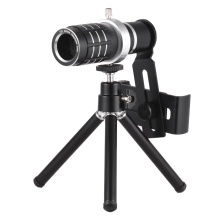 Mini tripod: made of superior aluminum material. Stand on the flat surface stably.